The Hitachi WH10DL “Micro” impact driver performs well beyond it’s diminuitive size. It features a 10.8 volt (12 volt max) 1.5Ah Lithium Ion battery technology and has a whopping 840 in/lbs of torque, an impact feature, an LED light, reversible variable speed (400 rpm max operating speed), and weighs in at a mere 2.2 lbs. The WH10DL includes two batteries, 40 minute charger, and a nice hard side carrying case. For new tools, Hitachi offers a lifetime warranty on their Li-Ion cordless tools, and a full 2 year warranty on batteries. I picked it up as a refurb for $59 plus s/h from ReconditionedSales.com, so warranty is only 1 year on this unit. At 2.2 pounds and a handle with a 5-1/2” circumference, the WH10DL is really comfortable and easy to control. The best part is that it has surprising power, and the impact feature is something you’ve got to experience to appreciate. The impact feature essentially applies a rotational hammering force that kicks in automatically when the driver lugs under load. That feature adds a tremendous amount of driving ability with much less force than a traditional driver without the impact feature. The impact feature is also a terrific ally when trying to remove stuck or rusted screws and bolts. I also find that I strip the heads on far fewer screws as a result of the impact driver. The WH10DL isn’t likely to drive long 1/4” lag bolts in hard maple for very long compared to a full 18v heavyweight driver, but it’s plenty capable of driving and removing 2” drywall screws in hardwood, deck screws, and most common sizes of threaded fasteners with relative ease, which is exactly what the majority of my needs are. The WH10DL feels great in hand, runs strong, holds a charge well, and recharges quickly. There’s not much not to like, but I do have one significant complaint…the exclusion of an on-board bit holder is a fairly significant omission. 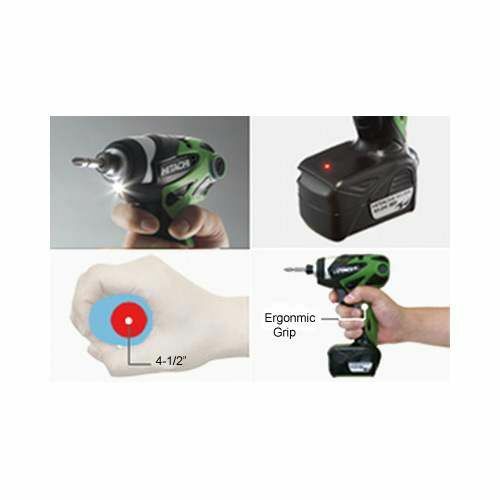 It’s hard for me to imagine how or why Hitachi would have left out such a convenient and common feature that’s found on most other cordless drill drivers. I like it so much that I’d give it 5-stars if not for this oversight. Overall I’m pretty happy with it and it’s easily my favorite go-to driver now. Hard to beat for $65 to my door. I have several Hitachi cordless power tools and I like them quite a lot. I feel they make a good product and they are reasonably priced for home hobby use. I have been looking at these and considering getting one. In the past I have generally gone with DeWalt products and focused on their 18 volt drills as my go to drill/driver. But I have gone from 4 batteries down to only 1. For this price I could buy a new drill for less than the cost of one battery. Scott, I have the 18 volt and 14.4 volt drill/drivers. They have an LED light, but are powered by a separate “button battery”. Does this one have it powered by the main re-chargeable battery? Yes….it’s built into the front of the driver and runs off the main batts. I always value your reviews Scott you stay on top of tools and their specs and always do great evaluations . Thanks for the tip. Scott Bryan: Dewalt battery prices(and repair parts) are exactly the reason I have went to other brands. Knot: this looks very tempting. Have you used it much yet? How about battery drain? I have a Hatachi drill that is very comfortable but the batteries don’t seem to last very long. They aren’t lithion. I really like the looks and feel though and I need an impact drill. This just might fill the bill. Thanks for the review. Howie – I’ve only had this version for a few weeks, but I had a non-impact version (DB10DL) that was otherwise nearly identical and used the same batts, same charger, etc. Most of my tasks this time of year are for a few screws here and there, so I’ve never used either one of them from full charge to no charge, so I can’t really say how long they’ll run continuously….based on what I have witnessed, it seems as though they would go a long way, but obviously it’ll depend on how hard they’re being used. I will say that my older DB10DL would hold charge for weeks and even months between chargings, so I expect the same from this one. I also have a 14.4v NiCad Hitachi impact driver, 19.2v Cman C3 impact driver and drill, and a 12v NiCad Hitachi drill, neither of which hold charge for nearly as long as the Li-Ion batts on the little Hitachi micro. Thanks for the comments Jim and everyone. Thanks for the reply, knot, I think it has merit so I think I’ll try one. I have this driver and its amazing,had it for over a year. Its perfect for most people who do construction, don’t use impact drivers on detailed work like furniture, it will brutalize your work. It has an impact feature but it is no rotary hammer, will not go through concrete efficiently. This review says it’s about the WH10DFL, but the pictures show the WH10DL, two different drivers… They are very similar so i can see how they could be confused. As for concrete I recently did a job screwing exterior rubber mats using 1 inch 3/4 screws and it was so easy I wondered if it was fastened well enough! As a matter of fact, I’ve been able to drive 1/4 inch by 2 inch 1/2 screws, but that’s pretty much the useful limit. Maybe that’s what ChrisCarr meant by “will not go through concrete efficiently”... Still not shabby at all for a 2.2 pound tool!